In the Third Edition of Managing Investment Portfolios, financial experts John Maginn, Donald Tuttle, Jerald Pinto, and Dennis McLeavey provide complete coverage of the most important issues surrounding modern portfolio management. 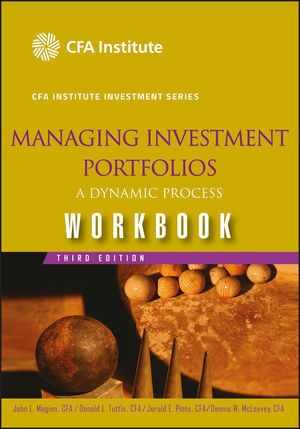 Now, in Managing Investment Portfolios Workbook, Third Edition, they offer you a wealth of practical information and exercises that will solidify your understanding of the tools and techniques associated with this discipline. This comprehensive study guide--which parallels the main book chapter by chapter--contains challenging problems and a complete set of solutions as well as concise learning outcome statements and summary overviews. JOHN L. MAGINN, CFA, is President of Maginn Associates, Inc. He is an adjunct professor at Creighton University. DONALD L. TUTTLE, PHD, CFA, was vice president of CFA Institute in its Curriculum and Examinations Department from 1992 to 2004. He received his PhD from the University of North Carolina at Chapel Hill. JERALD E. PINTO, PHD, CFA, is Director in the CFA and CIPM Programs Division at CFA Institute. He holds an MBA from Baruch College and a PhD in finance from the Stern School, and earned his CFA charter in 1992. DENNIS W. MCLEAVEY, CFA, is Head of Professional Development Products at CFA Institute. He holds a doctorate from Indiana University and earned his CFA charter in 1990. PART OF WILEY'S EXCITING NEW CFA ALLIANCE. CFA Institute has over 83K members in 129 countries around the world, and developed and administered the renowned Chartered Financial Analyst® Program. This book gives readers access to the best in professional quality information on managing their investment portfolios. COMPREHENSIVE GUIDE. This Workbook offers students problems and solutions to the rich text in Managing Investment Portfolios, 3e. EDITED BY AN AUTHORITATIVE TEAM OF EXPERTS. Maginn, Tuttle, McLeavey, and Pinto all carry the prestigious CFA distinction and use their expertise to update this authoritative text for both professionals and learners of all backgrounds.